An embedded systems developer with experience of working on production and prototype development projects for safety-related systems, Tim heads up MIRA’s intelligent mobility activities. Self-driving cars have long been a tantalising science fiction vision of the future. In the last few years we have seen a glimpse of this future through impressive demonstrations of self-driving cars from groups at Google, the University of Oxford, the University of Parma, and many others. These demonstrations have done a lot to advance underpinning technologies and algorithms, and they have caught the imagination of industry, academia and media alike. If intelligent self-driving cars reach public roads in significant numbers they could bring major benefits including fewer road traffic accidents, optimised traffic flow and improved fuel economy. However, there is still great debate about whether or not we will ever really see transport systems like this on public highways. The challenges we now face are not just technical, but also focus on factors such as user acceptance, legislation, safety and security issues, as well as co-operation with the ‘normal’ vehicle fleet already on our roads. What is clear is that this transition to autonomous driving won’t happen overnight. Furthermore, this ‘in between’ state where we have partial autonomy in our cars and a mixture of human drivers and automated vehicles on our roads is likely to last a long time. In fact when you look at the latest generation of Advanced Driver Assistance Systems (ADAS) already for sale you could argue that this transition has already started. (1) How we will interact with vehicles that provide partial autonomy? (2) How we will drive our own cars around autonomous traffic? 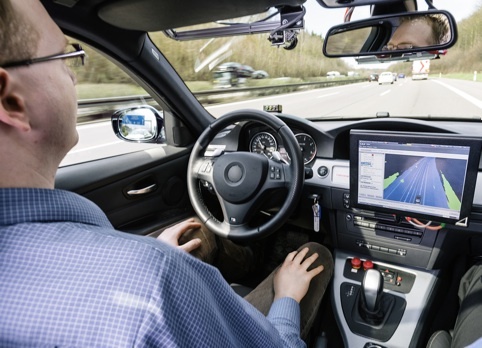 In the automotive industry there is already a trend towards partial autonomy, with ADAS affecting more functions of the vehicle with increasing levels of authority. Whilst full autonomy is technically feasible, there is a huge engineering leap from current generation ADAS providing partial autonomy in very specific driving situations to full autonomous driving in every situation. Once full autonomy is introduced it would need to account for the fact that the driver could be completely distracted from the driving task; for example they may be working, reading or even asleep. 1. How do you transition control back and forth between the driver and the vehicle? 2. How do we manage emergency transitions – situation beyond the capability of the control system, or a system fault? 3. How do you keep the driver informed of the ‘intent’ of the vehicle – future path, sudden acceleration or braking? 4. Will there be areas where certain types of vehicle automation are not permitted? And will there be areas where it is mandatory? The other interesting topic here is the technical gulf emerging between vehicle types on the road. Even as increasing levels of autonomy start to enter the market, the majority of cars on the road will remain under human control. Although the majority of us drive carefully on the roads and give consideration to what others might do next, this is not always the case. We may even negotiate behaviours by leaving space for another driver and possibly also signalling this concession with a flash of the lights or a wave of the hand. At intersections it can take nothing more than a moment of eye contact to be sure the adjacent driver knows you are about to pull forward. If we start to drive more in situations where the driver we can see behind the wheel is not actually controlling the car our gestures may go unnoticed, it is quite possible that the next course of action that car chooses is not the one we would intuitively have expected. At the logical extreme there could be autonomous cars on the road travelling with no driver at all as it moves to collect its next passenger. How will that affect the drivers on the road around it? Google have already encountered this issue whilst testing their driverless car at American intersections. Their autonomous vehicle would correctly give way to other vehicles at a junction but when the time came for its turn to move, they found other drivers would jump out in front. To give some insight into where this all might lead they had to program their car to be more assertive, meaning that their vehicles will now start to creep forwards at junctions to signal their intent. The same kind of issues could also happen in highway driving. On a busy section of motorway it is rare to see drivers maintaining the recommended safe following distance. An autonomous vehicle following the letter of the law (speed) and best practice (following distance), would likely find itself being cut up, and possibly also tail-gated and aggressively undertaken. Given that recalls for faults affecting safety have the potential to cripple companies, is it realistic to think they will push ahead with these systems? Given the relative complexity of the problem, perhaps we should start with driverless trains first? The potential introduction of autonomously guided vehicles brings to mind the tale of a third world country that decided to change from driving on the left, to driving on the right. In order to avoid confusion they stated the change would be made ‘gradually’…..
Apocryphal stories have a way of morphing, JohnK. That “third world country” was Sweden, and the proposal there was, “First, we’ll switch over only the lorries, then switch automobiles, then…oh, that won’t work!” Big laugh around the table. I suggest the first fully autonomous vehicles be “errand vehicles”, which would go to the shop, other destinations, and pick up groceries, laundry, prescriptions…small stuff. They won’t need excessive speed, their mass will be small, and their passengers absent. When the “fail/safe” systems get all the bugs out, then graduate to human-carrying systems. I started programming in 1982. I don’t foresee as many problems as others seem to worry about. So please give everybody an automatic system and make the transition as fast as possible! Every hour people are dieing because nothing is done while technology is available!